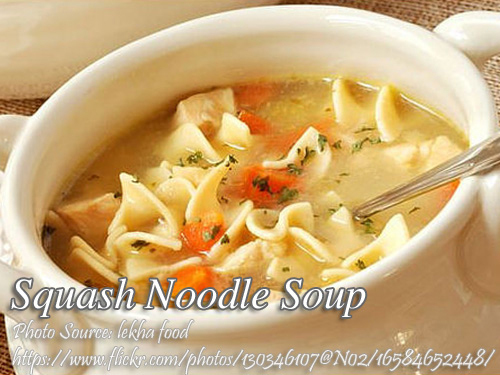 This squash noodle soup recipe is a healthy noodle soup recipe and consists of noodles made from boiled and mashed squash added to the noodle dough mixture. This is good specially to those who doesn’t like to eat squash. Making the noodles is also easy and it doesn’t require a noodle maker. Only a rolling pin will do. But if you have noodle maker, the better to make the noodles as evenly shaped and as thin as possible. The soup is made from vegetables like carrots and cabbage, chicken meat, chicken broth. It’s a great comfort food that you must try. To make squash noodles; In a bowl, combine all ingredient for noodles. Form into a ball. Allow dough to rest 10 minutes. Knead the dough and flatten on 2 layers of waxed paper, top and bottom. Cut into long strips like any typical noodle. How to make Squash Noodle Soup: Heat cooking oil and saute garlic and onion. Add the chicken, cabbage, and carrots. Pour chicken broth and simmer for 5 minutes. Add the quail egg and noodles. Season with salt and pepper. Simmer again for 3 minutes. Serve hot topped with spring onion and crushed chicharon.